The bones associated with saints and objects associated with Christ are known as relics. In the Middle Ages they were generally believed to have miraculous powers and were greatly venerated. Relics were kept in containers called reliquaries. This is an example of a personal reliquary, in the form of a pendant tablet. Personal reliquaries were popular in the Middle Ages and were worn by clerics and lay people alike. Relics were believed to have prophylactic (protective) powers and were usually worn close to the body for a more efficient use of that power. 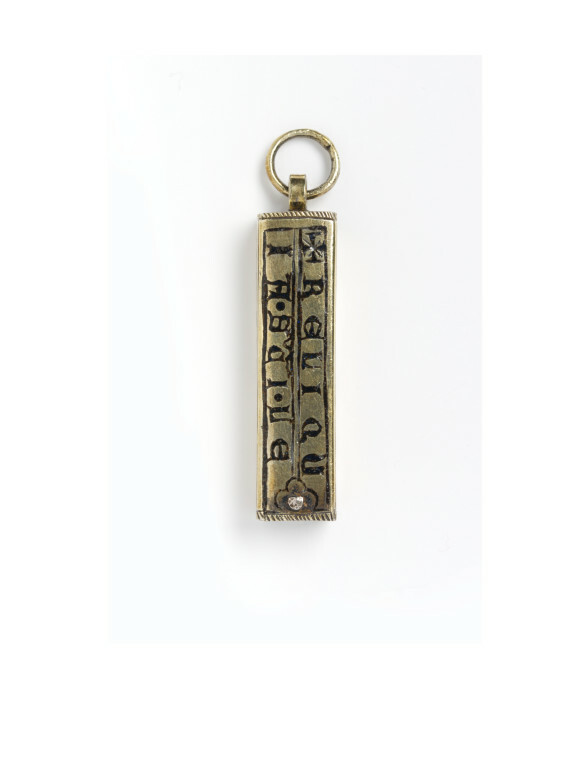 Silver-gilt reliquary pendant in the form of a hollow bar-shaped tablet, closed at the top by a plate with a suspension ring attached, and open at the bottom. The relic is held within by a bar running across. The tablet is engraved and enamelled with translucent enamel with the inscription, on one side: '+ RELIQU / IA . SA[NCT]I . LE'; and on the other: 'ONARDI. * / CREMONE*'. '+RELIQU / IA . SA[NCT]I . LE' / 'ONARDI . * / CREMONE*'. Acquired from Signol, Paris, as North Italian, c.1300. According to Lightbown, this is too early for the technique of transluscent enamel on silver to be used on such an object. He considers a date later in the fourteenth century to be more likely. Historical significance: Lightbown (see bibiliography) noted that there is no saint or holy man of the name of Leonard from Cremona. In this case the the relic held within the pendant may have been those of St Leonard of Limousin, a 6th century hermit whose popularity spread to Italy. However the cult of Saint Leonard of Noblat is known to have been celebrated in Cremona, where there is a church dedicated to him. It isthus more probably that the pendant refers to a relic from the Church of Saint Leonard in Cremona. This object is an example of a pendant reliquary. Personal reliquaries were popular in the Middle Ages and were worn by clerics and lay people alike. Relics were believed to have prophylactic (protective) powers, and were usually worn close to the body to ensure the most efficient use of that power. Some personal reliquaries enabled relics to be removed, possibly for the purpose of touching or kissing the relic. Reliquary pendant, silver-gilt with enamelled inscription, made in Italy, ca. 1350.